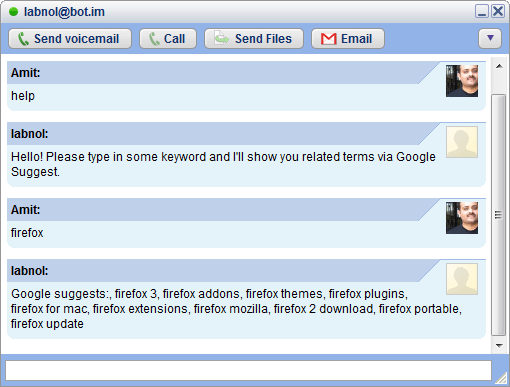 IM Tutorial: Learn how to create an IM bot for Google Talk, Yahoo! Messenger, AOL AIM and other instant messaging clients. This quick tutorial will show you how to develop your own functional IM bot that works with Google Talk, Yahoo! Messenger, Windows Live and all other popular instant messaging clients. To get started, all you need to know are some very basic programming skills (any language would do) and web space to host your �bot�. For this example, I have created a dummy bot called �labnol� that listens to your IM messages and return related search phrases based on Google Suggest. To see this live, add labnol@bot.im to your GTalk buddy list and start chatting. Step 1: Go to imified.com and request an invite. You should also give your bot a decent name because you can have just one bot per email address. Step 2. An email with a secret key should arrive in your Inbox the next minute. Copy that key to the clipboard and go here to redeem that key. Step 3. Now it�s time to create a bot which is actually a simple script that resides on your public web server. It could be in PHP, Perl, Python or any other language. More here. This is the source of the PHP script I wrote for the labnol IM bot - pretty self explanatory - it reads your message, gets the relevant data from Google Suggest and echoes it back to the IM window. Step 4: Once your script is ready, put it somewhere on your web server and copy the full URI to the clipboard. Now login to your imified account, paste the script URL and add that im bot your friends list. That�s it. This was a very basic bot but the possibilities are endless. For instance, you could write a bot that will send an email to all your close friends via a simple IM message. Or you could write one that will does currency conversion. See stuff that is already implemented in this list of most useful Google Talk bots.